Alternative (hopefully free!) to Garmin Training Center on a Mac? I like my Garmin Edge 205, despite its occasional hiccups (if I go very fast over a lot of potholes it turns itself off). However I don't like the Garmin Training Center, not least due to the spelling of Center. Firstly, the basemaps are useless and I'm not forking out for better maps seeing as I plot my courses on bikehike anyway. Secondly, it usually fails at least once or twice to read the recent ride from the Garmin. I have to unplug my device and plug it in again. This gets boring. I wonder if the failure-to-read thing is a Mac-only problem (Training Center for Mac is fairly recent, I believe). 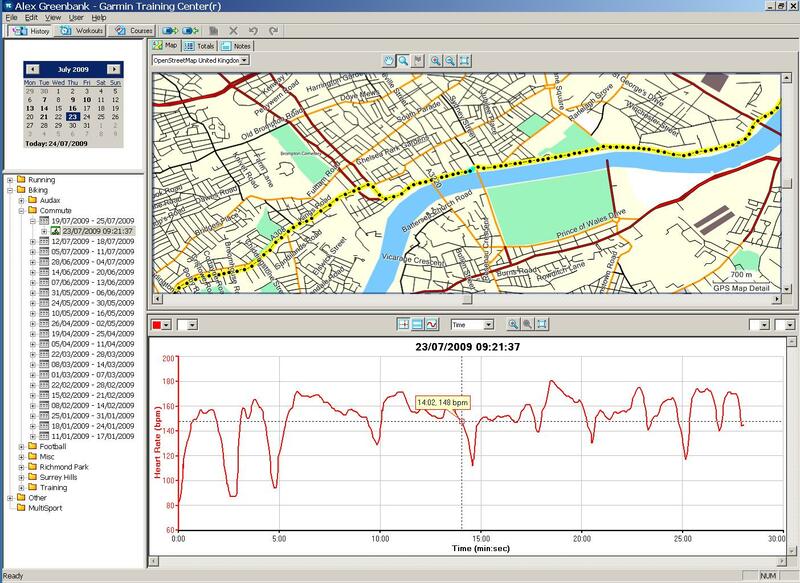 Anyway, it's annoying me a great deal, and I wondered if anyone has any other similar program that they use on a Mac with their Garmin which works better. I like the 'turn it on, plug in the Garmin, it automatically downloads the data' side of things, but not the 'unplug and then replug it in four times before it works' issue. Thoughts, as always, greatly appreciated! PS I have seven months' worth of data on the GTC, not sure if this is a problem but it won't seem to let me export it. I may have to just delete it. Re: Alternative (hopefully free!) to Garmin Training Center on a Mac? I lived in the US long enough for for me to get used to it. I often forget which way round I need to spell words like: liter/litre, meter/metre, tyre/tire, etc. Never had that, but then my data comes from Garmin Forerunner 405 to the ANT Agent over ANT+, not to GTC directly. The ANT agent puts the files in a certain place so that GTC reads them when it starts up and imports them. GTC on the Mac as it doesn't have ANT+ support but I still use it by exporting my workout history from the PC version and importing it on the mac (serves as a useful backup too). You can import the backup files. The backup file of my GTC data is 81MB. The best I have found so far is [ul=http://www.montebellosoftware.com/index.html]Ascent[/url] - not free, but cheap. Yes, I have downloaded Ascent and am looking at it. I like it so far, but it seems not to take the Garmin's info when I'm stationary (i.e. the clock pauses on the Garmin) so I am getting a different - slower - average speed. I think I will probably cough up the £27 for it but I will check through a bit more first about whether this issue can be resolved. Sorry Greenbank, I didn't reply to your post previously (thank you for the thoughts). I tried and failed to find OSMaps that worked on a Mac with Garmin Training Center so decided to go down the 'alternative software' route and am so far quite pleased with Ascent (see my reply to Cunobelin). I shall spend a little more time with it and see how it goes after the initial attraction wears off! Hi Why don't people pay for software. Ascent is great for the Mac and all the updates are free. If it costs nothing who will fix all the issues and newer gps units may not be supported. Garmin is a few versions behind for the Mac i think. Paid for the old Gpsy 12 years ago and it still works on a old Mac. Had lot's of updates for free. I purchased Ascent a few days ago and I am fairly happy with it. The reason I don't like to pay initially is you can never quite tell if it's going to work - once I realised it would suit me then I was happy to hand over the £30. Sorry, LEL has taken up most of my time. I haven't tried getting OSM into Mac GTC yet, but I'll give it a go some time soon. Just tried Ascent - It looks magic. Still on the trial version but might even splash out the 30 quid for this. I splashed out the £30 and have been very happy. When my Mac died and I thought I'd lost the code I was willing to buy it again, even after only two weeks' use (although fortunately I found the unlock code). One hint - it seems to give figures different than the Garmin. You need to pic "movingtime" and "movingaveragespeed" rather than time and avg speed as they include stops. My Garmin often seems to lose the beginning of journeys so I only get 3/4 of the journey. Ascent can't read the extra either, nor can Garmin Training Centre, so it's just one of those things. The unit itself will have the total distance and time but if I download it Ascent and GTC will both often have the same, shorter ride details. Another very good alternative to Garmin Training Center is MyTourBook. It's open-source and written in Java so it's supported by Windows, Linux, and Mac OS. Besides having really good data analysis features and the type of GIS integration that we're coming to expect from this genre of software, this program surpasses the alternatives (at least, the ones I've tried) with its ability to import and export data. The import function was particularly important to me because I had collected about 200 records of training over the past 18 months or so in an OpenOffice spreadsheet and I did not find the thought of manually entering that data into a new database particularly inviting. Reading this, the last sentence is a problem I had with my Garmin Edge which was entirely user-generated. I had set it to record at more regular-than-normal intervals so it could only hold an hour and a half's data. When I realised this and returned it to the default setting it was able to record very long rides with no problems. I still use Ascent and think it is excellent! Golden Cheetah: http://goldencheetah.org/ is another alternative. I used it for a while as it had nicer ways to display power data. Do most riding on fixed now and don't have a fixed PowerTap hub (one day I will! ).